That can get pretty pricey! 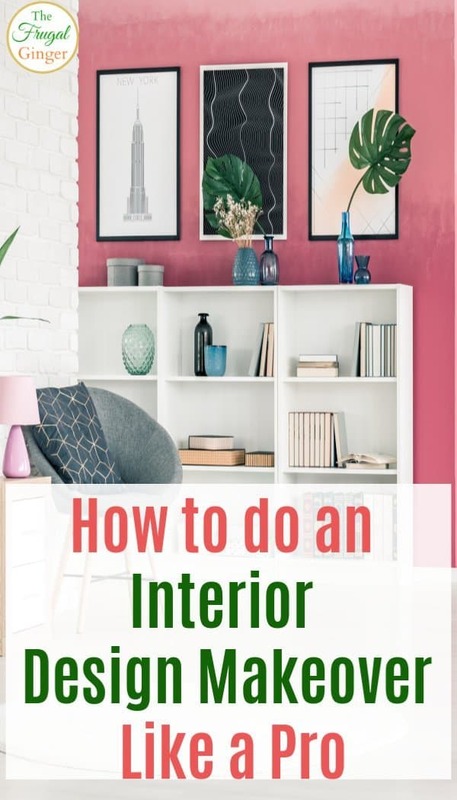 Luckily, I have done a lot of research and pulling off an interior design makeover like a pro doesn’t have to be that difficult or expensive. Before you even get started, map out a timeline of when you want to get things accomplished. Taking small steps will make a big project seem more attainable. You just have to do three main things to achieve the look that you will love for years to come. Before you even start picking out colors or themes, pull out a trusty tape measure. You want to figure out how to make the most of the square footage that you have. Choose a focal point, like the fireplace or TV, and start from there. Outline the dimensions of what you have and what you want to buy with painter’s tape. This will give you the chance to see exactly how things will fit and what size of items you will need. When designing your layout, leave about 18 inches between a sofa and a coffee table. You will also want to leave at least 12 inches between the rug and a wall. You can also use these other tips to find the perfect area rug for your room. To start, pick a favorite color or place. Somewhere that makes you happy: Paris, Hawaii, Rome, etc. as inspiration. Pinterest will be a huge help in creating an inspiration board where you can keep all of the ideas you love in one place! Figure out what interior design style you have. Are you more modern, traditional, rustic, relaxed, earthy, etc.? When it comes to colors, you want to stick to two easy going neutrals as well as one cool and one warm accent color. If you don’t want a bold look, have the neutrals be the wall and sofa while the accent colors are in the accessories. It is much easier to change the color of throw pillows and art than it would be to paint an entire room every year. A color wheel will be your best friend when it comes to picking complimentary colors. For fool proof mixing, choose colors that are opposite each other on the wheel. If you are doing a bold color on the walls, first consider the lighting in the room. You will want a warm tone for a north-facing room that gets a cooler light during the day. Choose a cool color for a sunny south-facing room. Before you settle, paint a small area of the room so you can see how it looks with the changing of light throughout the day. Adding art to the walls is a must for a complete look. If you have a smaller sofa, you can use a large-scale art piece above the sofa to add visual interest. Let color be the unifying link between your art, furniture, or accessories. For an affordable way to jazz up some existing pieces you already have, change the frames or replace the mat. If you want to put together a collage, lay all of the art on the floor to easily arrange them. Hang pieces at eye level or 8 inches above a chair back. To find some beautiful and affordable prints, check out Minted. They have something for every budget. If trying to do an interior design makeover like a pro still seems daunting, you could always try Havenly. For only $19 you can get a consultation with a professional interior designer. They can help steer you in the right direction and help you figure out your perfect style.